This gorgeous card will surely be the focal point of Mom's heart this Mother's Day! A stunning array of fresh, delicate tulips set on a background of pale pink and pink stripes…what a beautiful way to let Mom know how much you care. This Mother's Day card is bold, bright, cheerful, and lovely…just like Mom herself! With a vibrant mix of wildflowers, lilies, roses, and mums, your Mother's Day message of love is one that will be delivered in a style Mom is sure to love! This splendid Mother's day card features a classically romantic design of hearts, birds, and flowers, creating a special Mother's Day message of charm and beauty. And if all that beauty doesn't bring a tear to her eye, the title of "best Mom in the world" should do it! It's a card she will cherish forever. 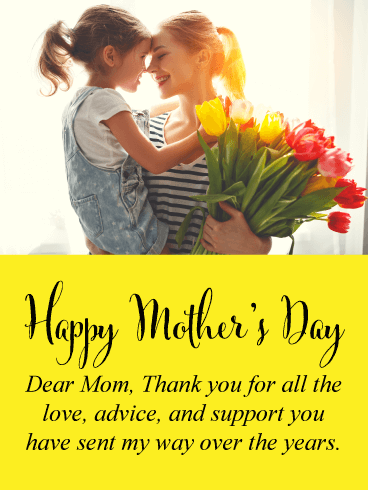 This eloquent Mother’s Day card contains a thoughtful and loving message that will bring tears of joy to your mother’s eyes. It expresses that she is not only your mother but also your best friend. This will mean so very much to her. Pink flowers and lace are displayed and give this Mother’s Day card a classy look. 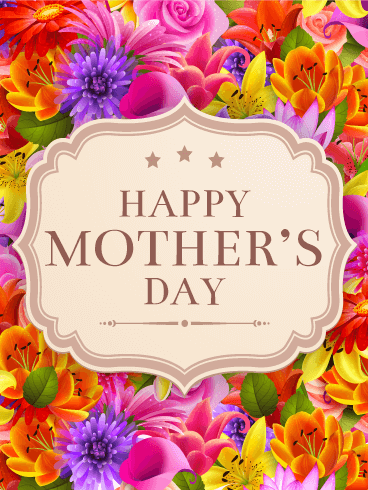 Be sure to let your mother’s know you are thinking of her today by sending this Mother’s Day are her way! This delightful Mother’s Day card will be sure to put a smile on your mother’s face when she receives it. It showcases a touching image of a mother and daughter. The Mother is holding gorgeous flowers that were given to her in honor of all that she has done as a mother. A special message is included that thanks her for all the love, advice, and support she has given you. Be sure to send this special Mother’s Day card out today! 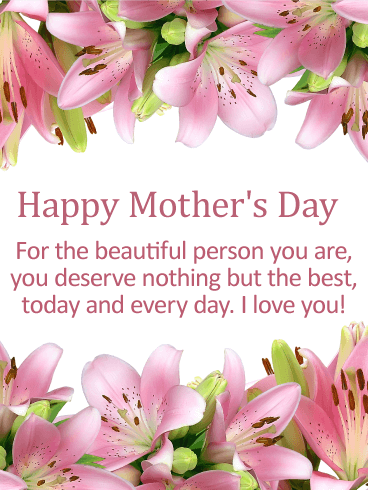 Let your loving mother know how much you appreciate her with this beautiful Mother’s Day card. It will certainly touch her heart on this special day. It features lovely flower pots and pretty roses and expresses that you love your mother with all your heart. What could be better than reading this on Mother’s Day! If you would like to send the best card ever to your mom this Mother’s Day, then you are in luck, because you have just found it. This awesome greeting card displays wonderful colors of blue, red, pink, and white, and features flowers, hearts, and a delightful gift box! 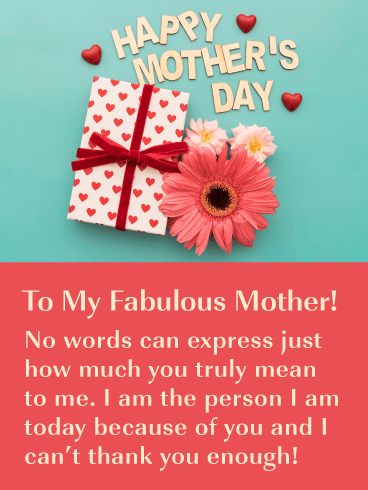 This Mother’s Day card is worth sending because your mother will be so touched when she reads that no words can express how much she means to you. 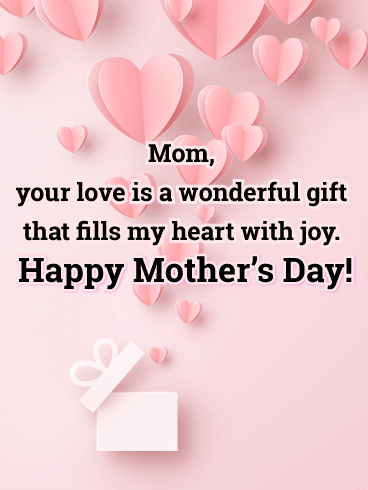 A mother’s love is unconditional, and this special day would be perfect for letting her know how much you appreciate all the love she has given you over the years. 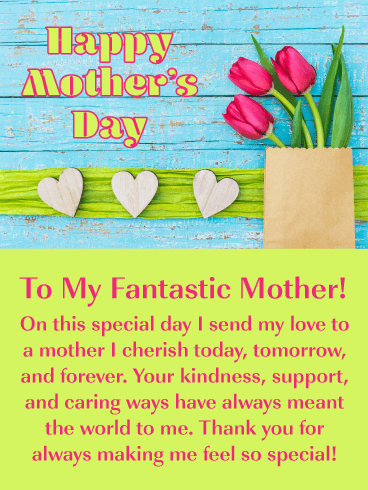 This beautiful Mother’s Day card will brighten her day and make her feel loved, especially after she reads the caring and thoughtful message. 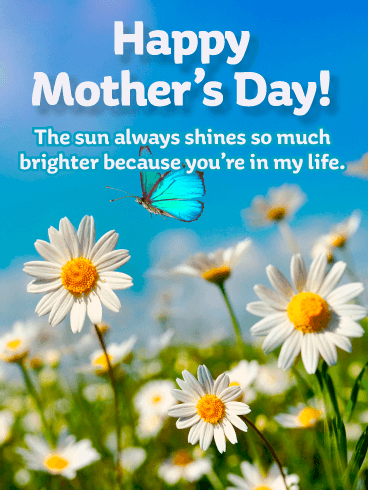 Send this delightful Mother’s Day card to your mom without delay so she knows you are thinking of her on this important day. 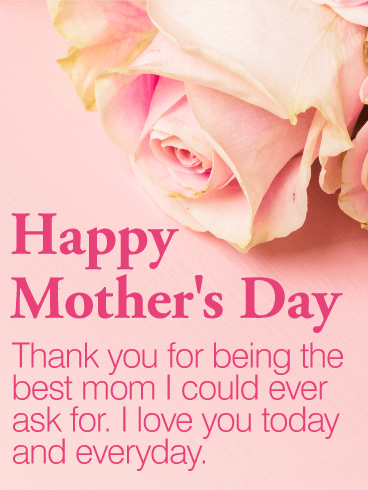 This pretty pink Mother’s Day Card contains thoughtful words that will let your mother know how much her love, guidance, and support has meant to you over the years. It’s what every mother would love to know on their special day. Pretty hearts and the phrase ”I love u mom” is displayed just for your mother! It will certainly make her day even more special. 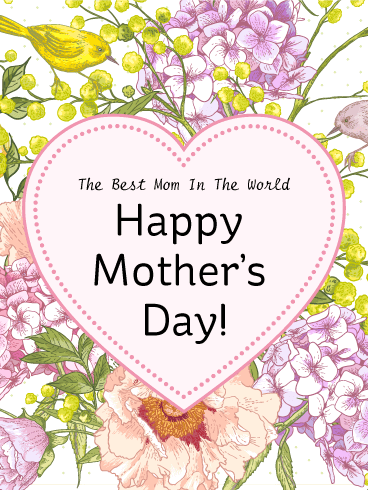 Mother’s are the best, and they should be given the very best Mother’s Day card in recognition of this big day! 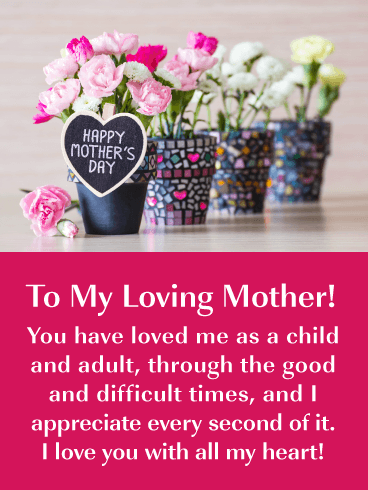 This splendid greeting card contains a beautiful image of lovely flowers in a teacup, a perfect gift box, and a note that says “For the Best Mom”. She will certainly love this Mother’s Day card! With that being said, make sure to send it out today so she can enjoy it on her special day. 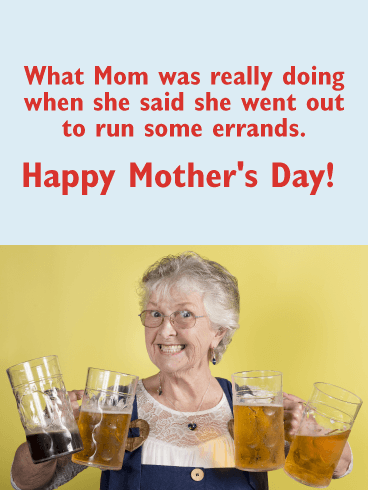 If your mom has a great sense of humor, then she is going to just love this funny Happy Mother’s Day card. It features a hilarious image of a grown man dressed in baby clothes and sleeping like a peaceful baby. The message expresses that you are glad that she has continued to love you now that you are an adult, so you don’t have to dress like a baby to gain her affection again! 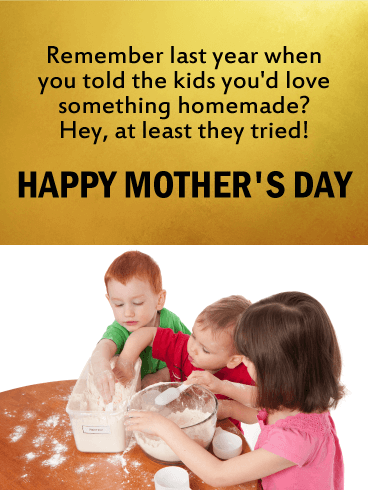 This Mother’s Day card is so silly, she will have to laugh! 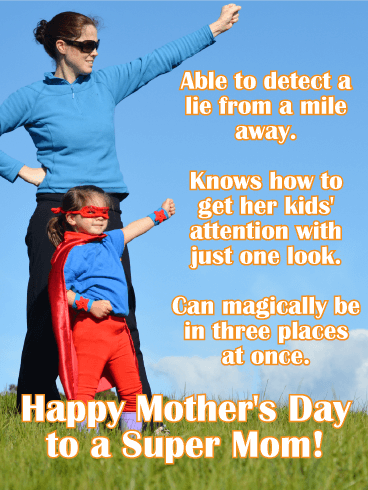 If you think your mother would appreciate a good laugh, then be sure to send her this humorous Mother’s Day card. 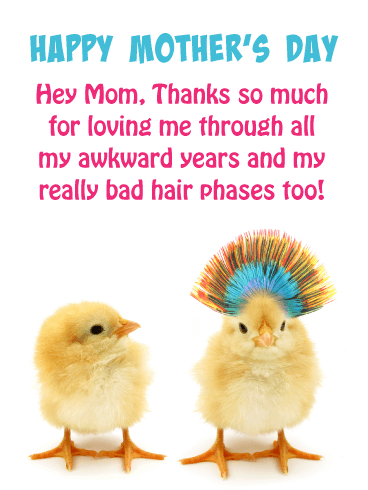 This awesome card showcases a cute and funny image of a chick with a very colorful Mohawk! It represents the awkward years and bad hair phases that your mother had to put up with when you were a teenager! She loved you no matter what, so it’s time to finally thank her! Make your mom’s special day extra special with this fabulous Mother’s Day card. The colors are absolutely stunning, the flowers are pretty, and the hearts add a nice touch. The kind words will touch her heart, especially when she reads that you cherish her today, tomorrow, and forever! Your mother is going to be so happy that you took the time to send her such a thoughtful Mother’s Day card. 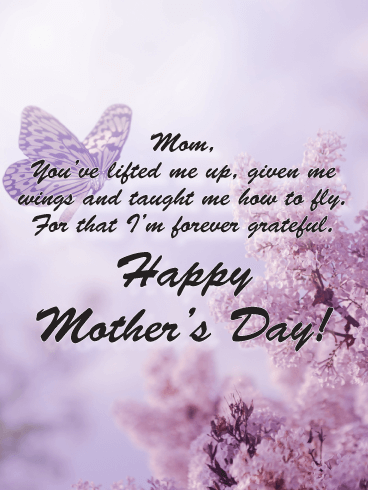 For your mom who has lifted you up, given you wings and taught you how to fly, this Mother’s Day card is a heartwarming sentiment. The soothing purple background, highlighted by a butterfly hovering gracefully, is a wonderful way to wish her a day filled with love and happiness. Sweet daisies sway in a field on a sunny day, as a lovely blue butterfly flutters by. What a charming card to wish a special mom a very happy Mother’s Day. It’s a chance to let her know that the sun shines so much brighter having someone as amazing as her in your life. She’s sure to be touched by your kind words as she celebrates this special day. Nothing blooms brighter than a mother’s love, and Mother’s Day is the perfect time to let her know. This charming deep pink and rich blue card features pretty tulips, the signature flower of spring, and comes with a thoughtful message to the woman who means so much: the love she shows is enough to make a whole garden grow. Your mom is your everything, and you want her to know exactly how you feel on her special day. So this Mother’s Day, send a card to show how much you care. A sweet floral print in the background creates the perfect setting for helping her celebrate her day in style and the words are there to remind her that she means so much to so many, especially you. Three hearts hang together, spelling out m-o-m, on this card for the most special woman in your life. What a charming way to wish your mom a happy Mother’s Day! Simple but sentimental, the words let her know that she’s always in your heart, no matter how old you get or how far away you may be. A gift box gives way to lots of hearts, flying into the air. What a wonderful way to make your mom’s spirits soar on Mother’s Day! This touching card will fill her celebration with joy as much as she fills your heart with joy each and every day. It’s a great way to remind her how much she’s loved. A young boy rubs noses with his mom, a tender show of affection to let her know he loves her. What a wonderful symbol of the special bond between you and your own mom. 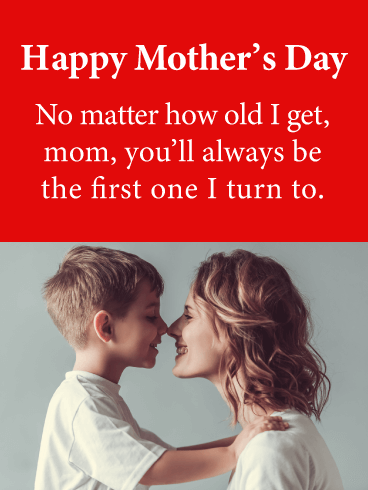 No matter how old you are, or how much physical distance is between you, she’ll be touched by this Mother’s Day card and will smile knowing just how much she means to you and that she’ll always be the one you turn to. A mother has so many important roles: friend, teacher, hero. But the most important job of all is being the one you’ve looked up to from the very beginning. On Mother’s Day, celebrate the love you have for your mom with this touching card. Featuring a young girl surprising her mom with flowers as she gently kisses her on the cheek, it’s a heartwarming reminder of just how much she means to you, no matter how old you may be. This Mother’s Day card delivers lots of heart and plenty of humor! A bunch of adorable kittens sitting in pastel flower pots will make Mom say, “Aww!” But what will really make her smile and laugh is the message that having her as your mom is better than cuddling a bunch of cute kitties? What a sweet and fun way to make sure she has a wonderful day. These two pool cuties have something in common with their mom: they’re totally cool…and they know it! 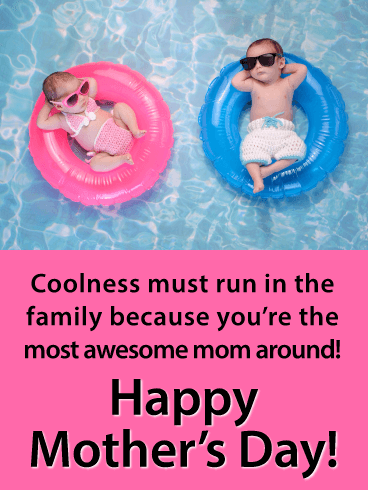 Celebrate the most awesome mom around by sending this fun Mother’s Day card to remind her that being amazing runs in the family. No matter how old you are, or how many miles away you may be, it’s one greeting sure to leave a big smile on her face. Over the years, Mom has seen it all and done it all. 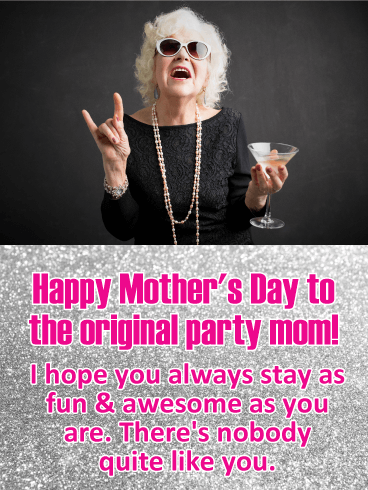 So on Mother's Day, let her escape for a moment with this hilarious card that reminds every mom she deserves a chance to forget all the craziness with (more) than a few cocktails! Perfect for the mom whose kids are all grown up or even grandma, it's a fun way to make her smile as she celebrates her special day! What's the best way to toast an amazing mom on Mother's Day? This fun & colorful card! 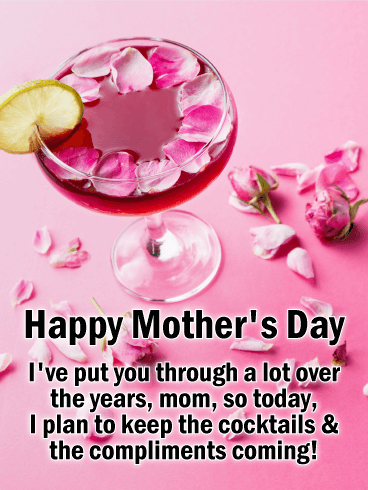 A splashy pink drink surrounded by rose petals is a sweet touch, but what will really make her smile is the sentiment below, promising to keep the cocktails and compliments coming, as a way to make up for everything you've put her through over the years (not that she's counting)! Both bright and full of fun, this Mother's Day card will have Mom feeling a "hole" lot of love! 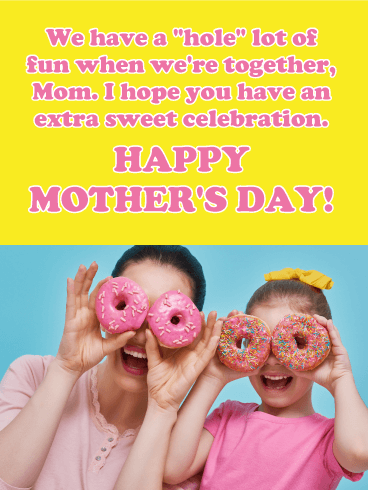 A mom and her young daughter are having a silly time holding donuts up to their eyes, a sweet reminder of how much you enjoy being together, and sharing these small but special moments. She's the one, the only, the original! We're talking about your mom, a total party animal who loves to have fun. 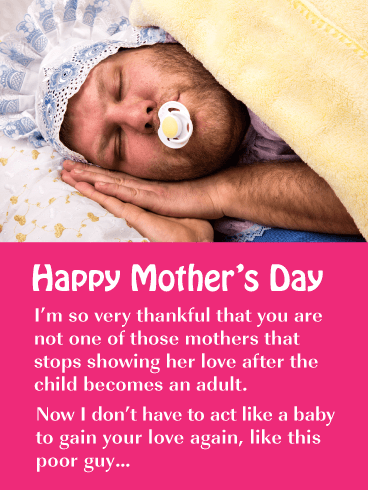 Make her laugh out loud (literally) with this hysterical Mother's Day card, which is perfect for any mom, or grandma, who's got a real wild streak and loves to show it! 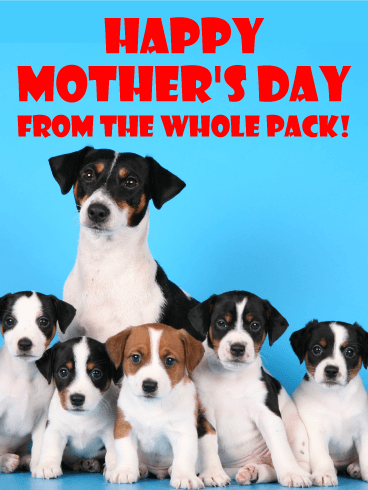 This adorable Mother's Day card is sure to make any special mom say,"Aww! "A litter of adorable puppies stay close to their own mama, looking loved and protected. It's a simple yet sweet way to let her know just how much she means to you, and a great choice to send from the whole pack! She's the "purr-fect" mom in every way! 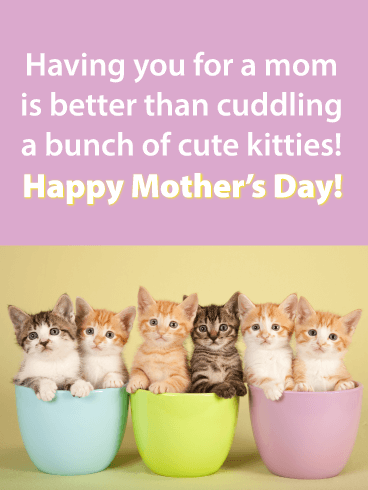 Let her know this Mother's Day with this cat-tastic funny Mother's Day card, featuring a sweet kitty surrounded by hearts. 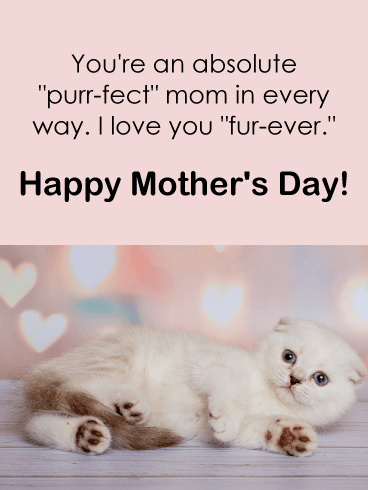 Whether she's got older kids, little ones or fur babies, Mom will appreciate the sentiment as she celebrates, knowing she is "fur-ever" loved! 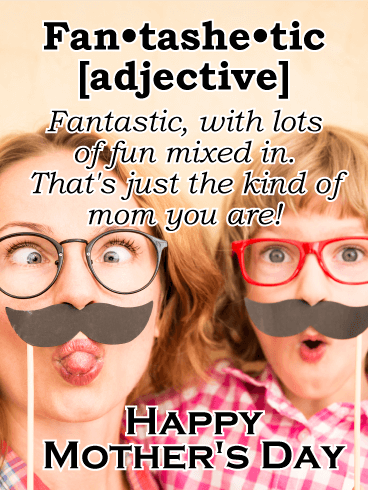 This Mother's Day card is equal parts silly and sentimental! A mom and her partner in crime are sporting their spectacles, prop moustaches and funniest faces to remind your own mom that she's one in a million. What a wonderful (and wacky) way to make her feel loved and remembered on her special day! 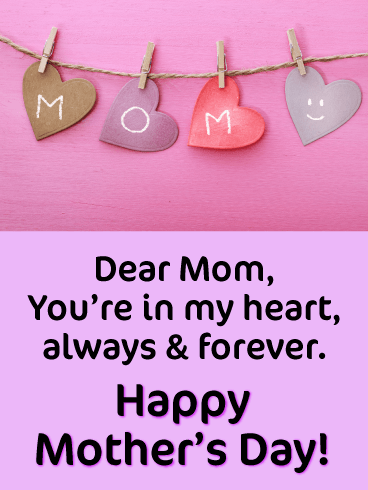 For every super mom out there, this is the Mother's Day card to send! Featuring a mighty mom and her caped cutie, it's a fun greeting that's a true testament to all the amazing things she's capable of every day (even those that may get her kids in trouble!) But the best part of sending this greeting is the way it will make her feel, knowing she'll always be your hero. Every mom's been there. She loves knowing her kids put a lot of thought into their "made with love" gift, but sometimes the results aren't what she expected! Mixing humor and heartfelt sentimentality, this Mother's Day card is one every mom can relate to, which will only make her smile more! 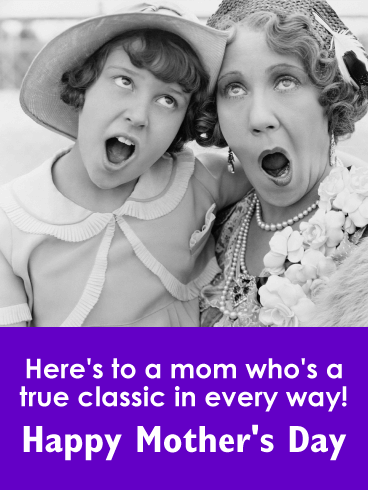 Show mom you appreciate her classic style with this Mother's Day card that blends humor with a whole lot of heart! An old-fashioned black-and-white photo of a mother and daughter having a little fun together will let your own mom know how special she is to you, while giving her a few laughs along the way! 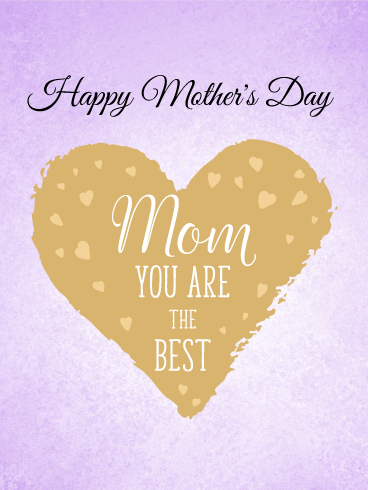 Every son would want to tell their mother that they are the best mom, and Mother's Day is the perfect day to let her know. 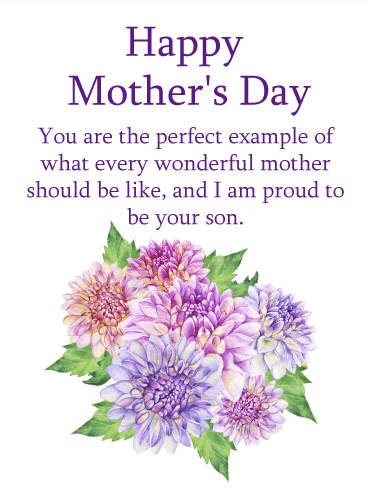 This wonderful Happy Mother's Day card features colors of gold and purple, along with a heart that says, "Mom You Are The Best". This will warm her heart and she will feel that you are the best son! 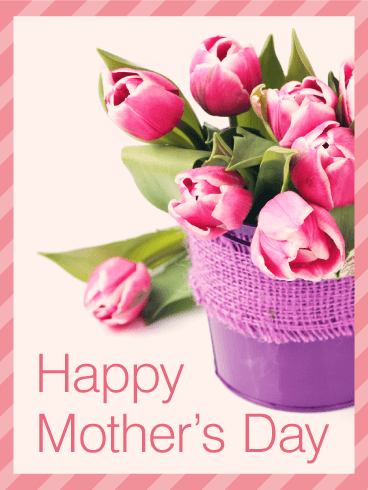 Make your mother feel special by sending this beautiful Mother's Day card out today! Thank your mom for being a wonderful mother with this vibrant Mother's Day card. She will be so happy knowing that you are thinking of her on this special day! The bright red flower looks spectacular against the blue background. Your mother will love it! 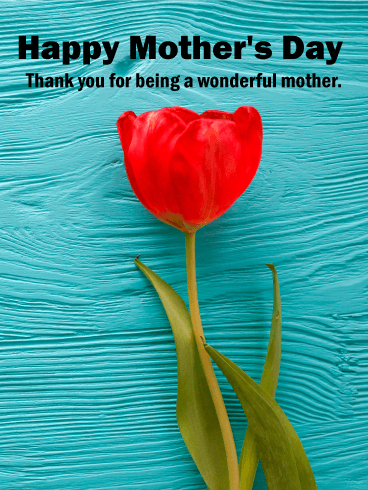 As her son, you will want to send your mother the very best to thank her for all her years of love and kindness, so this Mother's Day card would be perfect! Mother's Day arrives once a year so it's important to send your mom a message that lets her know you feel you are lucky to be her son. 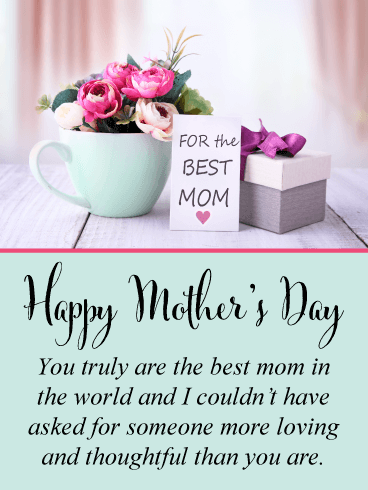 This special Mother's Day card will tell your mom that she is loving, caring, and thoughtful, which is exactly what every mother would want to hear from their son! It displays a creative heart formed from a cloud held up by clothespins, very clever and fitting for the occasion. Sending flowers for Mother's Day is a tradition that will never end because Mothers love receiving flowers, especially from their son! 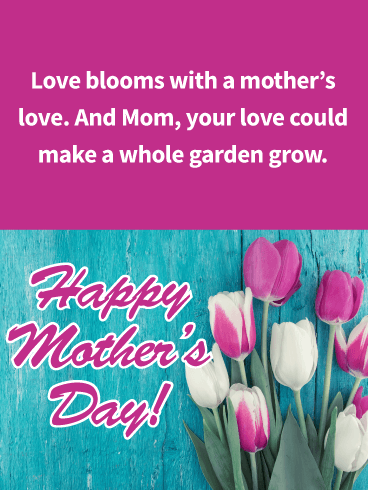 Not only does this Mother's Day card feature beautiful flowers, it also displays a message that could bring a tear of joy to her eyes. It tells her that she is a perfect mother and that you are proud to be her son. A mother could not ask for anything better for Mother's Day! 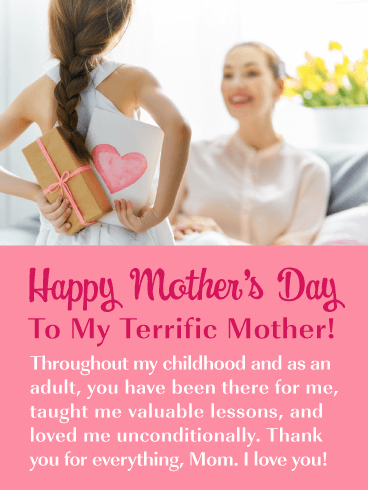 This touching Mother's Day card that features a pink rose captures what this special day is all about, a mother loving and teaching her child, and being responsible for the man he becomes. Imagine the happiness she will feel when she receives a meaningful message like this from her son. Be prepared to get a phone call immediately after sending it, she will want to thank you, her thoughtful son, for sending such a nice Mother's Day card!